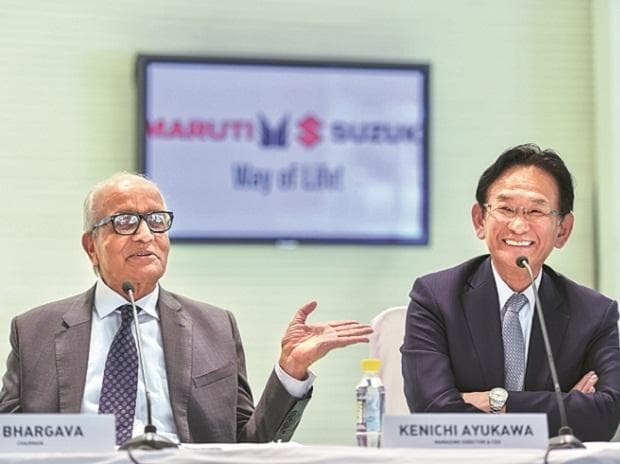 The country’s top carmaker, Maruti Suzuki, on Friday reported 10 per cent growth in profit for the quarter ended March 31, 2018. Net profit for the three months stood at Rs 18.8 billion, lower than analysts’ expectations of over Rs 22 billion. The company said an increase in corporate tax rates affected profitability. Maruti Suzuki also reported a record annual profit of Rs 77.21 billion for the year ended March 31. Its sales revenue grew 14.4 per cent to Rs 206 billion during the quarter, helped by 11 per cent growth in car sales to 461,773 units. The company’s stock price had gained over 2 per cent on the BSE before the announcement, but slipped almost 2 per cent later to close at Rs 8,778. The average realisation per vehicle for the quarter rose 3.3 per cent to Rs 406,000. This was also a function of a lower average discount at Rs 13,900 per vehicle compared to Rs 15,194 in Q4 of FY17. Royalty payment for the quarter stood at 5.7 per cent of the sales revenue, against 5.4 per cent in the corresponding period of FY17, primarily a function of the yen-rupee fluctuation. R C Bhargava, chairman of the company, said the increase in corporate taxes to 29 per cent in FY18 (against 26 per cent in FY17) affected profitability. “We did better in all aspects over FY17 but there were certain unforeseen and exceptional items,” he added. The company’s non-operating income due to mark-to-market impact on invested surplus had a bearing on performance. The company had to pay Rs 2.5 billion to HSIIDC to settle demands for an enhanced compensation to landowners for the Manesar plant during Q4. “The impact of firm steel and alumninium price alone for the year is Rs 7 billion,” Bhargava said. The Suzuki promoted firm clocked a near 17 per cent jump in sales revenue for the year to Rs 781 billion. Profit, however, grew by just 5 per cent during the year against a 37 per cent jump in FY17 (over FY16). Maruti Suzuki, which sells every second car in the country, saw its volume grow by 13.4 per cent to 1.77 million units in FY18. The average realisation per vehicle for the year was Rs 397,000 against Rs 381,000 during FY17. The discount per vehicle for the year was down to Rs 15,849 vis-à-vis Rs 16,748 in FY17. Royalty paid to parent Suzuki for the entire year came down to 5.4 per cent against 5.8 per cent in FY17. Bhargava said the company’s board and Suzuki had approved the new royalty mechanism under which payments to Suzuki would be made in rupee. Maruti Suzuki will also get a volume-linked discount from parent on royalty based on certain benchmarks. The three new models — Ignis, Dzire and Swift — have already come under the new mechanism and all models are expected to be covered by 2021. Bhargava said 5 per cent is the cap under the new mechanism and by 2021 royalty will be lower than 5 per cent. The company has also decided to create an Employee Welfare Fund which will get 1 per cent from the annual profit every year, beginning FY18. The money will be used to create housing infrastructure for employees and subsidising home loans among other things. It will also set up a trust to promote scientific research and technology in India. This trust will also get a per cent of annual profit.